13 Above: World's Most Creative - Cork Mosaic ! 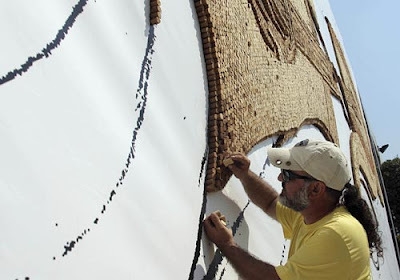 Pop art ... the Albanian artist who created the world's largest toothpick mosaic has set another world record with a mosaic made of 229,764 corks. 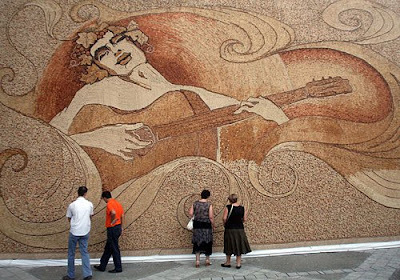 Big plans ... artist Saimir Strati, 42, created a cork mosaic of a guitarist at the Sheraton Hotel in Tirana, Albania. 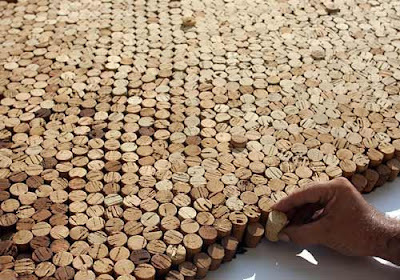 The artist told visitors to the hotel to "Drink, because I need the corks." He worked 14 hours of work a day for 28 days. 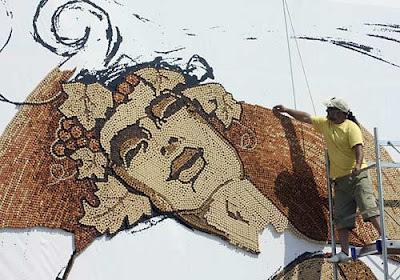 Mediterranean tribute ... Strati glued 229,764 corks of various shapes and colours over a plastic banner measuring 12.94m by 7.1m to show "Romeo with a crown of grapes playing the guitar while dancing with the sea and the sun"
Backing the champion ... Albanians have been following Strati's third world record attempt much more closely than his previous two record-breaking pieces of art, a portrait with nails of Leonardo Da Vinci and a galloping horse made with toothpicks. Dot matrix ... "I love mosaics, they are a dying genre. 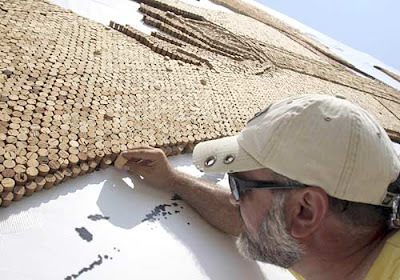 I follow the same technique used 3000 years ago," said Strati, at work here on his cork mosaic. 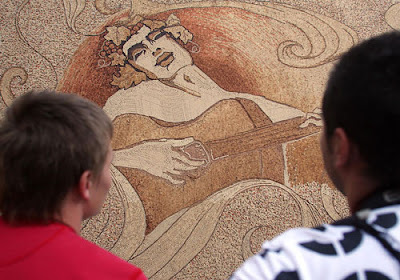 "A mosaic requires you to work for a long time and keep the emotion alive," said Strati. He has a 25-year-old mosaic collection which features one created with fragments of egg shells and a portrait of Elvis Presley, made with compact discs. 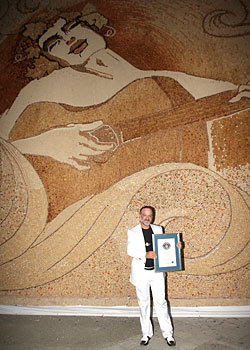 Record-holder ... Albanian artist Saimir Strati holds his certificate from Guinness World Records adjudicator Carlos Martinez in front of the largest mosaic made of corks in Tirana. Take it in ... visitors to the Sheraton Hotel in Tirana, Albania admire Starti's finished cork mosaic.